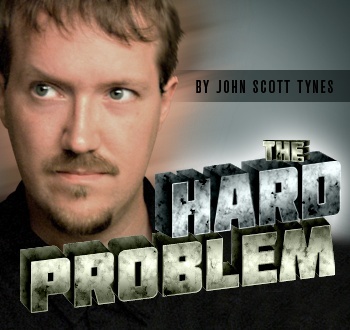 Welcome to The Hard Problem, a new column where I'll tackle a hard problem in game design and then solve it before your very eyes. Or at least take a good shot at it. This month, I want to talk about Good vs. Evil. In games like Knights of the Old Republic, BioShock, and Fable II the developers attempt to expand your choices beyond which weapon to shoot by offering your character moral dilemmas. In general, I think such attempts have largely failed to deliver, and it's usually because the story's needs are in conflict with the game design's needs. The most obvious failing is the notion that choosing between the game's version of good and evil is a moral dilemma in the first place. It's not. What these games offer really is the choice between humanity and psychopathy - will you choose to be a human being or a murderous thug? That's not a dilemma. That's the difference between functioning and nonfunctioning brain chemistry. In our civilization, choosing between good and evil is no dilemma. The choices we make have more to do with things like selfishness versus selflessness, determining when truth is kind and when it's cruel, and whether it's okay to cheat to achieve your goals. A real moral dilemma is truly a dilemma, not an obvious choice. It involves equally weighted good or bad outcomes. Reasonable people could come to different conclusions based on their individual values or level of investment in the dilemma without either person's being evil. By contrast, look at the Knights of the Old Republic games. Their Star Wars IP is preoccupied with good and evil. You make moral decisions incessantly, and evil ones consist of being a sneering bully who steals, kills, and extorts openly and continually. But in the movies, the consideration of good and evil is much more nuanced. The Emperor, the story's baddest bad guy, spends years posing as a good person, slowly manipulating his way into power and gathering allies. No doubt he gives heavily to charity and passes legislation to fund hospitals - good acts performed for secret evil motives. He's a killer, but he's a far cry from the kind of murderous thuggery that represents the Dark Side in the KOTOR games, which has you mind-controlling people to walk off of cliffs and barking haughty, threatening insults at everyone. Another major failing of current games that explore moral choices is how your character starts as a blank slate. From the first moments of play, your character is equally capable of rescuing a princess or murdering her. What kind of person is so vague that he's capable of flipping between such extremes? By comparison, consider Luke Skywalker, a kind but impulsive farmboy raised by good foster parents. From the get-go, he's a specific character with a specific personality. When he takes his first step into a larger world it's not as a blank slate who evaluates good and evil as equal choices, but as one who naturally gravitates toward the Light Side. It's only when forces prey on his impulsiveness and compassion that he moves at all Darkward. But the movies never pretend Luke is ever one decision away from murdering children; instead, his choices are part of a long moral path, and his mentors explain that if he keeps making reckless decisions driven by his passions, he will eventually embrace the Dark Side. The key word there is "eventually" - Luke never even gets close. Therefore, a better storytelling approach relies on a defined character who is already on a clear moral or immoral path. The premise of the game establishes what forces drove the character onto this path, and the action of the game consists of embracing or resisting those forces.